Image caption Carlisle Crown Court heard told Sharon Hesketh was "deeply ashamed"
A "highly trusted" senior charity support worker who stole £2,735 from three vulnerable men has been given a suspended sentence. Sharon Hesketh worked for 4Eden and used the men's cards which were kept in the office of their accommodation in Penrith, Cumbria. 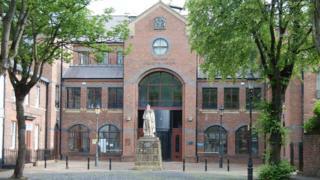 The 59-year-old pleaded guilty at Carlisle Crown Court to three charges of fraud by abuse of position. The judge handed Hesketh a 12 month jail term, suspended for two years. Hesketh, of Victoria Corner in Kirkby Stephen, was also ordered to complete a rehabilitation activity requirement. The court was told a total of £2,735.70 was stolen from the men - one with Down's Syndrome and two with learning difficulties - who were all "incapable of accessing and managing their own affairs". Hesketh's defence barrister Kim Whittlestone described her as "absolutely at the end of her tether" having "racked up significant debts". "She acted in a way that was out of character. This is a lady who is deeply ashamed of her conduct," she added. Sentencing Hesketh, Judge Peter Davies said: "You were trusted, highly trusted. "It is not the amount, it is your position in relation to these people and how much that money meant to them both as individuals and as a charity. "It's theft and there's no other way to put it."